Amazingly the Western corporate news media are still relying for information on events in Syria on a largely discredited news agency, the Syrian Observatory for Human Rights (SOHR), which regularly releases reports that portray Russian forces and their Syrian allies in a less than flattering light. Run by a lone Syrian expatriate, Rami Abdulrahman, there’s good reason to question why the corporate news media gives SOHR’s reports so much coverage, especially as by his own admission Abdulrahman hasn’t been home to Syria in 20 years. Adding to their questionable integrity, SOHR reports are often uncorroborated by any independent source. Leading some to suspect that the SOHR is being used as a disinformation outlet by Western intelligence; the objective being to shape the “news” and thereby influence public opinion. It has done this repeatedly by attributing civilian casualties to “Russian” or “Syrian” air strikes. Late in April there were reports of civilian casualties inflicted during attacks on a hospital in Aleppo. The SOHR claimed Syrian jets were responsible, while Stephen Lendman reported that U.S. backed militants were behind the attacks. Lendman’s report was further corroborated by eyewitnesses on the ground in Aleppo. The SOHR’s latest claims follow a familiar pattern. 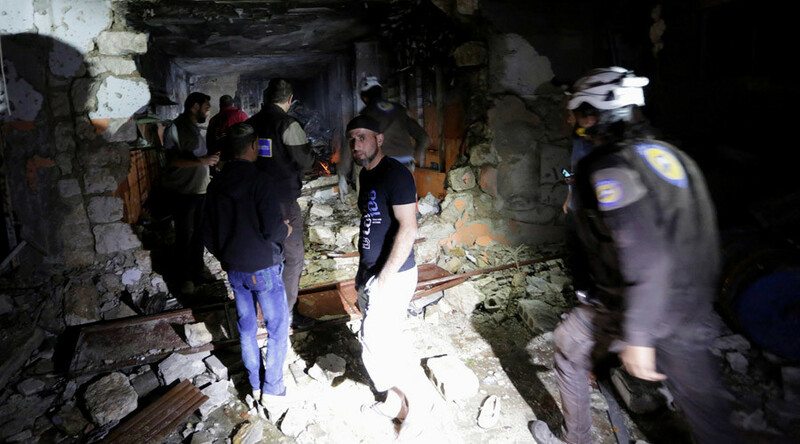 Another medical facility has been attacked and more children killed, this time in Idlib, and the SOHR immediately claims that “it was unclear whether the attack was conducted by Russian or Syrian fighter jets”. In other words the Syrian government or their Russian allies were responsible. Not the “Syrian opposition”. This line is now being echoed throughout the Western media despite Russian denials. As before, amid the fog of war the SOHR is working overtime to pin the blame for civilian casualties on Russia and its Syrian ally. At least 23 people were killed in Russian air strikes overnight in the rebel-held Syrian city of Idlib, the heaviest bombardment there since a cessation of hostilities was agreed in February, the Syrian Observatory for Human Rights said. The Observatory said the air strikes targeted a number of positions in the city, one of them next to a hospital. Seven children were among the dead, Observatory Director Rami Abdulrahman said. The toll was likely to rise with scores of injured, mostly civilians, in a critical condition. Residents of Idlib said hundreds of families had begun leaving the city for fear of further air raids. Two rebel sources said Russian jets also intensified strikes on towns in rural Idlib including Binish, Maarat Misreen and Saraqeb. However, a Russian Defence Ministry spokesman on Tuesday denied it had conducted air strikes overnight against Idlib, calling the Observatory’s allegations “a horror story” that should be regarded with scepticism. Russia deployed warplanes to Syria last year to support President Bashar al-Assad against rebels seeking to end his rule. The Turkish Foreign Ministry said the air strikes had killed more than 60 civilians and complained in a statement about what it said were the “indefensible” crimes of the Russian and Syrian governments. It gave no indication how it arrived at the higher toll. Later the monitor reported that unidentified jets bombed a major camp of the powerful Islamist Ahrar al Sham insurgent group in Syria’s northwestern province of Idlib, leaving a large number of dead and wounded. The Observatory, which tracks violence across the country, said top trainers from among Ahrar al Sham’s leaders were normally present at the camp, located in the Sheikh Bahar area of rural Idlib. A senior member of the group, who requested anonymity because he was not authorised to comment, said the report was unfounded but gave no details. Rescue workers searched for casualties through the night, finding some survivors including a child under the rubble of buildings, the Civil Defence said on its Facebook page. Idlib city and the province by the same name is a stronghold of rebel groups including the al Qaeda-linked Nusra Front.